Pork chop suey is a Chinese dish primarily made up of mixed vegetable with meat like chicken, fish, beef, shrimp or pork, added for extra flavor. Chopsuey is widely believe to be an American-Chinese immigrants creation, and not an authentic Chinese dish. They said, Chinese farmers was inspired to cook a stir-fried vegetables known now as chopsuey and ate them after a long day working in the fields. Cut the pork into thin strips. Combine soy sauce, oyster sauce, salt and pepper, and cornstarch. Stir to blend and then add the meat. Marinate for 10 to 15 minutes. Set aside. In a small bowl, whisk together broth, cornstarch, oyster sauce and sugar. Stir to blend and then set aside. Heat oil in a wok (or deep skillet) over medium heat. Fry pork for about 3 to 5 minutes. Add garlic and onion until soft and translucent. Stir in baby carrots for about a minute. Add the rest of the vegetables, stir-frying for a minute or two after each addition. Add the cornstarch mixture. Bring to a boil. Lower the heat and continue stirring until well blended and sauce thickens. Correct seasonings. Immediately remove from heat after heated through. Transfer to a serving platter. 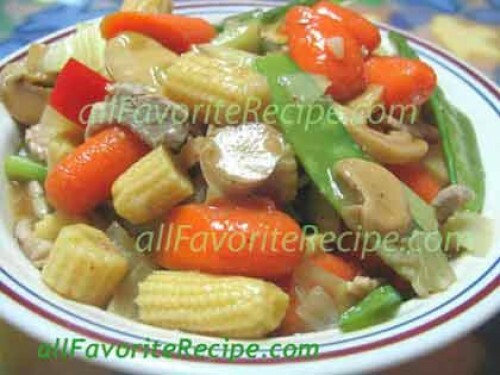 Serve hot the chop suey dish. thank you for this recipe. i like cooking which is healthwise. my family loves vegetables. hulog ka talaga ng langit sa akin para ma-improve ko naman ang pagluluto ko.salamat uli! I made chopsuey for my husband but used chicken wings instead.. we both loved it! a really good recipe! I will try another recipe from this website. Good job! oh my gosh! i just love this dish! i’ve been looking for any good sites having the right ingredients for this dish. i’ve got 3 kids and don’t know how to cook …my maid is planning to leave and so i need to learn how to cook. thank u very much…God bless you!!! Wow! 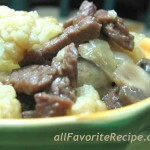 Great recipe…thanks much for sharing. thanks because i found this site. i can finally cook what i want to search here in this site…thanks god bless. thanks a lot,i know how to cook chop suey now. love this chop suey,expert in italian foods having an italian husband that loves this recipe so much.big help for me to learn how to cook our pilipino dish,leaving our country without knowing how.thanks!!!! I’m really lookingfor this site for it gives me information, knowledge on filipino recepi… thank you for the recipi which posted… more power and good luck!!! i love chop suey!thank you for the recipe. 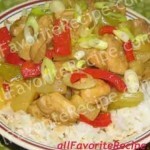 i love your recipes, like this Chop Suey Recipe…..
this Pork Chop Suey is good!!!!!!!!!!!!!!!!!!!!! super great recipe! ilang beses ko na na-try sa staff haouse namin,,,everyone love it! Wow! Thank u sa marami mo recipes magagamit ko ito sa barko yong ibang paraan nang pag luluto humba. at lahat na ulam nandito. Good luck! I hope na pagkaroon kayo nang culinary sch. intisado ako mag aralan lahat nang menu ninyo. Thank you! Thanks for the recipe! Mukhang marami ang may magandang review. Masubokan nga. Salamat ha! mmm…masarap talaga ang lutong pinoy…. im bicolana masarap tlaga e2. this Pork Chop Suey is good!